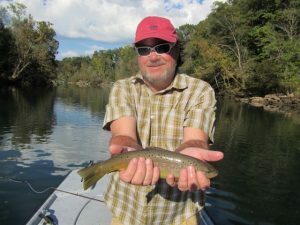 The fishing was tough both days but Jimmy and Robert really hung in there and caught some very nice Rainbows as well as a few Brown Trout like the one Jimmy has in the photo above. Our weather has been more like summer than fall and the water conditions have been excellent so it is a bit odd that we are experiencing some really great fishing on some days and on other days we are having to work really hard. Root Beer and Olive Midge patterns were good producers along with RG/PT Cruisers and Born’s Hairy Legged Sow Bug and 6X tippet was a must. 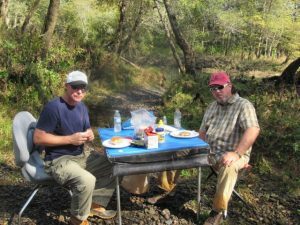 We look forward to fly fishing with Jimmy and Robert again real soon.